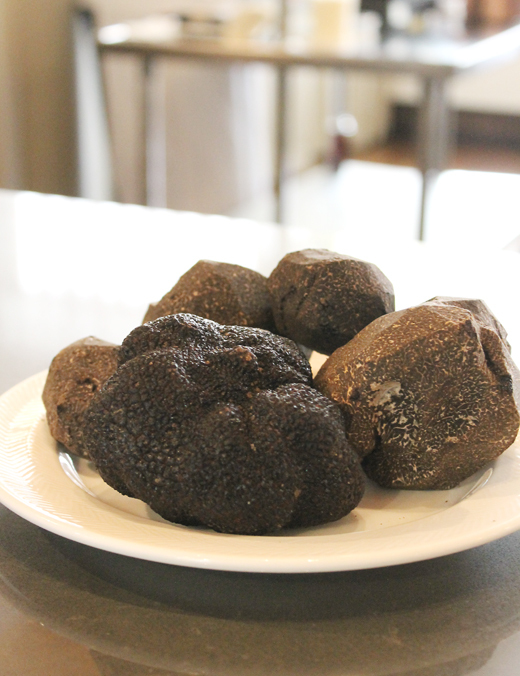 Black Perigord truffles. The darker one has been peeled already, hence its more pronounced color. Carefully tucked inside Chef Ken Frank’s walk-in at La Toque restaurant in Napa last weekend sat 20 pounds of prized black Perigord truffles. Valued at more than $13,000 — wholesale. They were destined to be the highlight of dinners, cooking demos and special restaurant offerings during last weekend’s Napa Truffle Festival. And they all came from Italy. 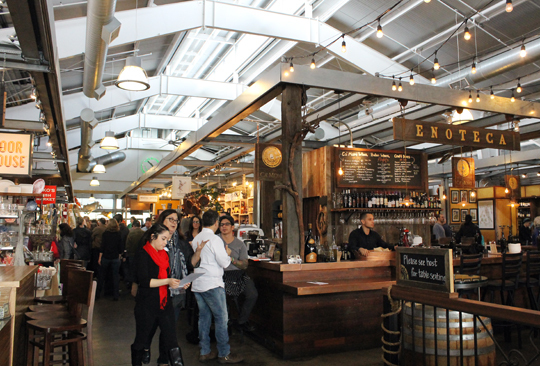 For the past five years that this festival has been held, all the truffles used have been picked in Italy and flown in three days later to Napa. But some day soon — possibly as early as this coming winter — black Perigord truffles may be harvested right here in Wine Country. That’s because a burgeoning industry is taking root in Napa and Sonoma counties, as vintners and other property owners are gambling on growing truffles. The American Truffle Company, which organizes the festival, has partnered with these interested folks to sell and plant filbert and oak trees that have been inoculated with the truffle fungus. 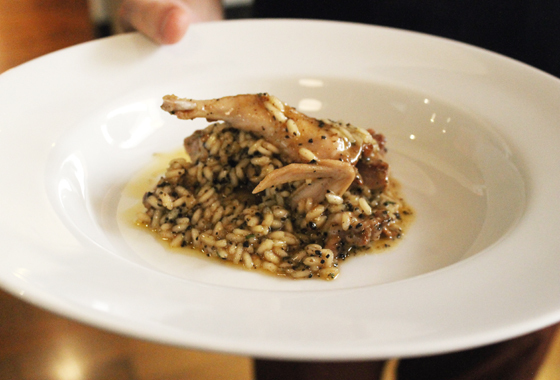 Chef Ken Frank holding a plate of black truffle risotto with quail that was made in a demo by Chef Roberto Donna. Once the trees are planted, it takes about five years for truffles to form. This winter, the trees of vintner Robert Sinskey, the first local client that signed on with the American Truffle Company, will be reaching that mark. 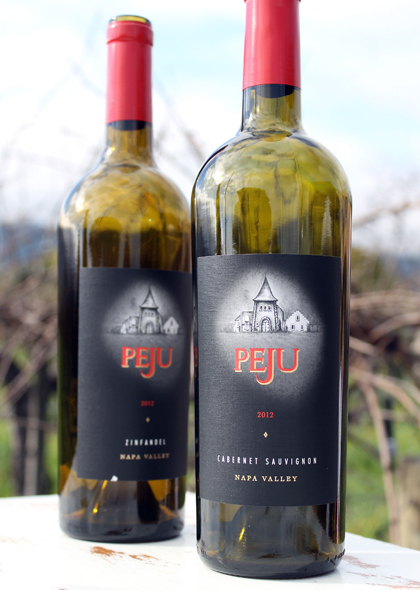 His may become the first Perigords to be harvested in Sonoma County. Already this year, teams of truffle-hunting dogs have shown a much greater interest in his 1 1/2-acre orchard than ever before, Sinskey says, indicating truffles may indeed be forming under his trees. 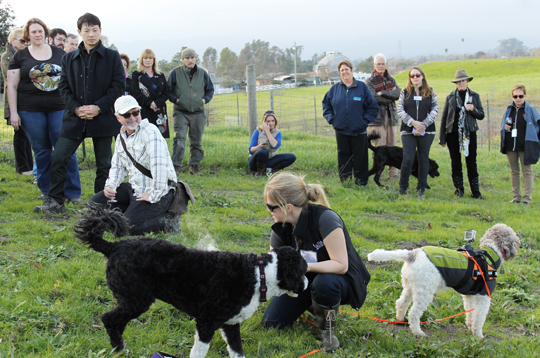 Festival-goers had a chance to see Sinskey’s orchard for themselves, as part of a demonstration to show how truffle-trained dogs go about their work. I was fortunate to be a guest at the festival, my first time to the event. 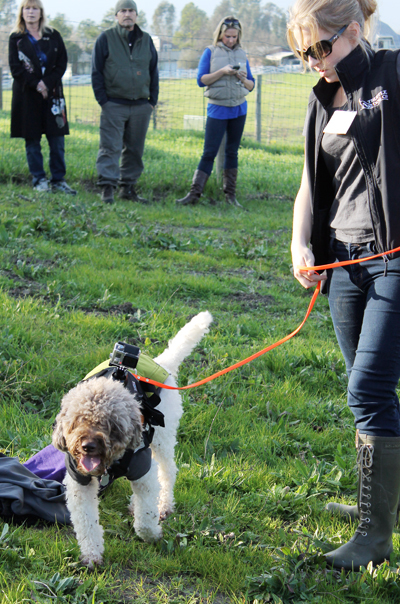 A truffle dog set to go to work, complete with a GoPro camera. Alana McGee preps her truffle dogs for a demo on the Sinskey property as vintner Rob Sinskey (white hat) and American Truffle Company Managing Director Robert Chang (behind Sinskey) look on. As Alana McGee, founder of Toil & Truffle Dog Company, explained, any dog can be trained to ferret out truffles, which grow underground. Although, pigs were used historically in Italy and France to do the job, dogs are the preferred choice now. That’s because most families already have dogs, which are also easier to control than pigs. Plus, if you’re spotted going for a walk with your pig in Europe, it’s a dead giveaway as to what you’re actually doing. With a dog by your side instead, it’s much more innocent looking. Chef Roberta Donna making pasta dough in La Toque’s kitchen. 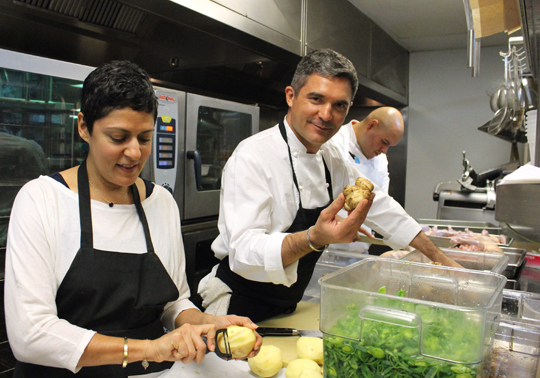 Chef Tony Esnault (center) holds up a sunchoke for his soup to be served at Peju Winery. Chef Roberta Donna of Al Dente Ristorante in Washington, DC was one of the guest chefs cooking at the festival. Born in the Piedmont region of Italy, famed for the even more exorbitant and rare white truffle, Donna remembers just how fiercely competitive truffle hunting can be. It was only done at night, he said, so that nobody could spot your secret location, especially because truffles will grow back in the same spot year after year. 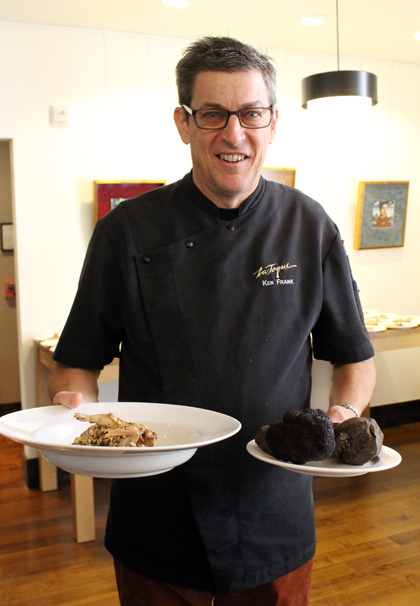 Even though he is excited that Napa and Sonoma are trying to grow truffles, like a loyal Italian, he is skeptical that they will ever be on par with what is produced in his native country. 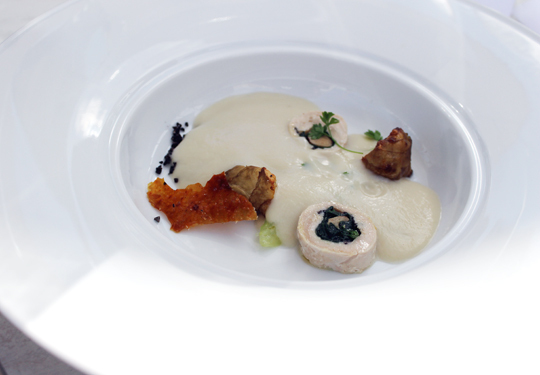 Chef Esnault’s sunchoke veloute with guinea hen, foie gras and black truffle. 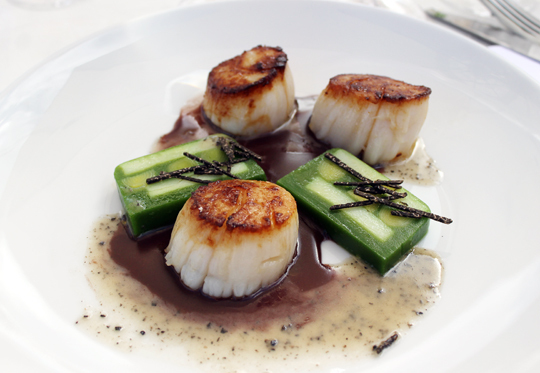 Perfect day boat scallops with a mosaic terrine of potato, leek and black truffle. 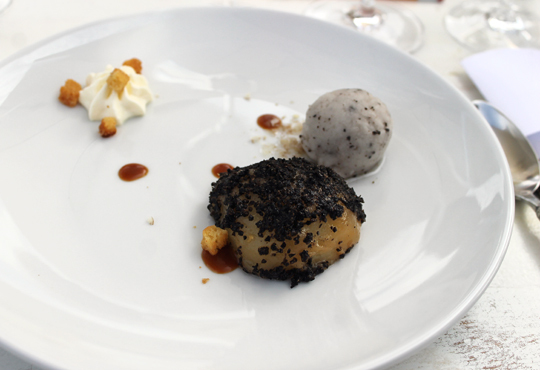 Bartlett pear covered with truffle alongside truffle sorbet. Joining Donna for the festival were Riccardo Agostini, executive chef of Ristoranti il Piastrino in Italy, and Tony Esnault, executive chef at Church & State in Los Angeles. Chef Donna’s pasta stuffed with teleggio with duck, Parmigiano and black truffle. 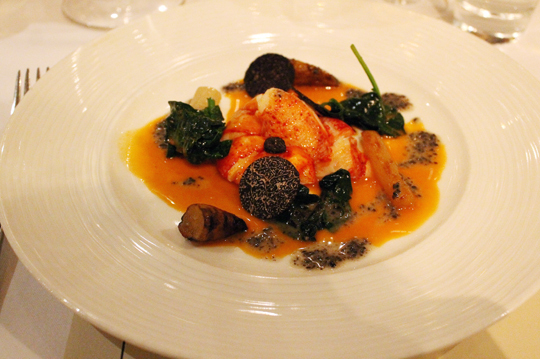 Chef Esnault’s butter-poached lobster, salsify, spinach and black truffle dish at the grand La Toque dinner. 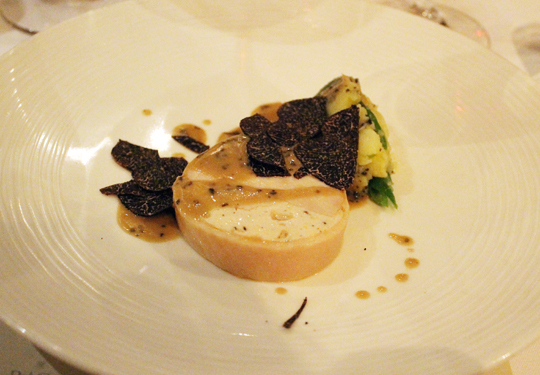 Chef Ken Frank’s truffle-stuffed capon. 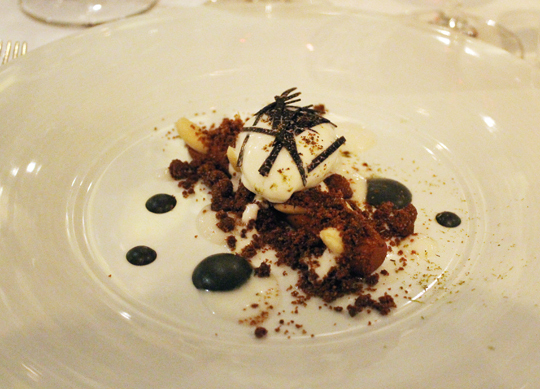 Chef Riccardo Agostini’s dark chocolate with almond ice cream and sweet black truffle sauce. 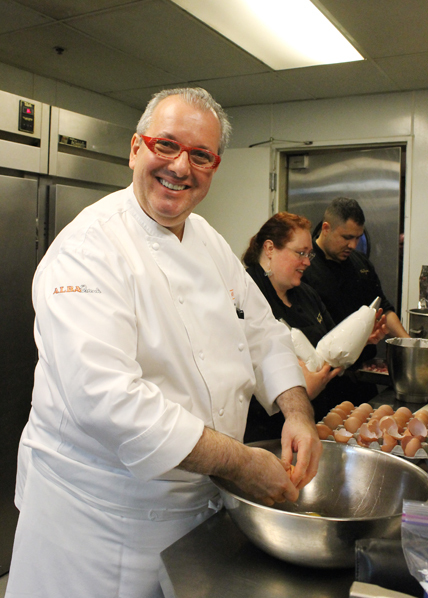 They worked alongside La Toque’s Frank, creating lunches at Peju and St. Supery wineries, as well as a lavish five-course dinner at La Toque. 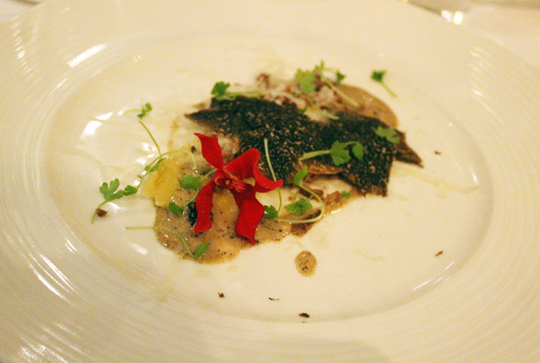 Every course at those meals — including desserts — featured a copious amount of heady black truffles. Chef Donna’s salad of octopus, lobster and chickpeas with black truffle dressing. Yes, imagine hummus with truffles! 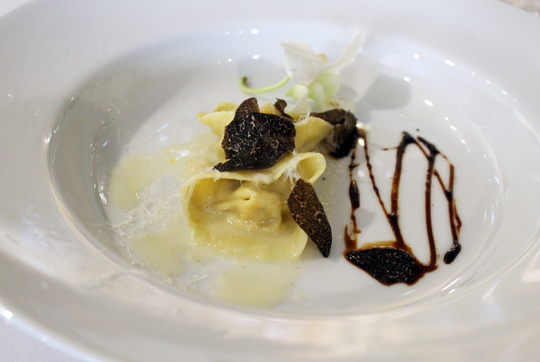 Butternut squash cappellacci with Percorino, blasamico and black truffle. 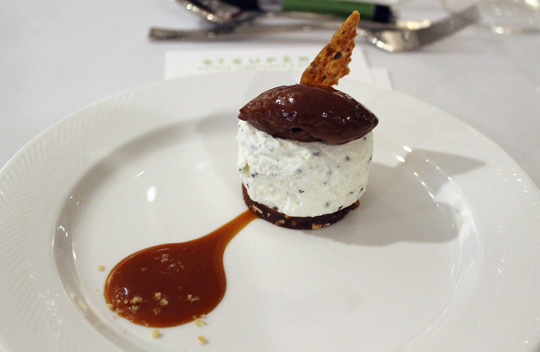 Chocolate ricotta caramel black truffle dessert. So much so, that it almost feels like withdrawal to go back to eating normally now. 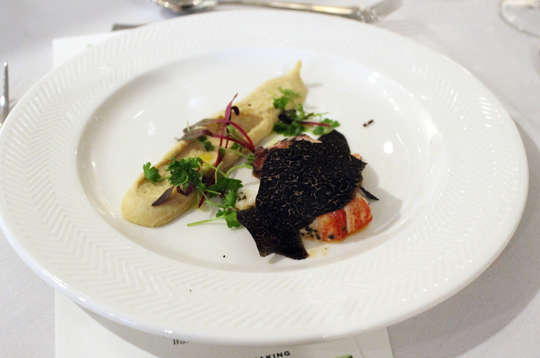 The festival culminated at Oxbow Marketplace on Monday, when merchants featured cooking demos and special menu dishes utilizing black truffles. 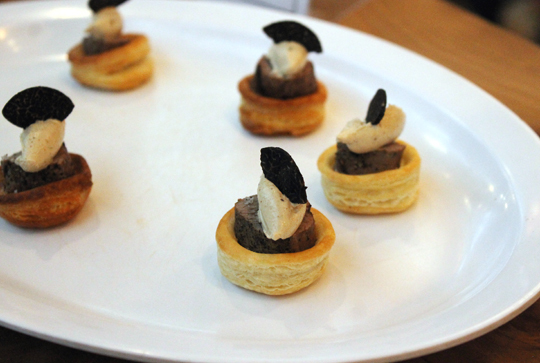 Five Dot Ranch featured mini beef Wellingtons with black truffle and wild mushroom mousse. 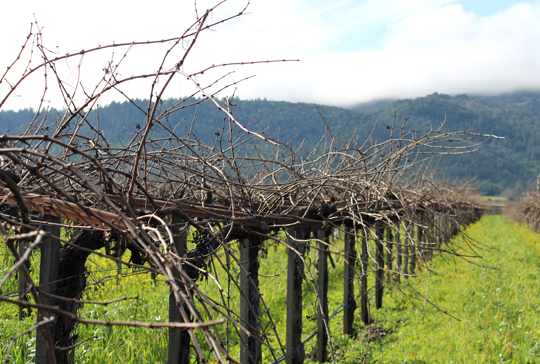 For more on how Napa and Sonoma are trying to grow truffles, see my story in the San Francisco Chronicle. What a feast! That’s so cool to see the possibility of getting CA truffles. I do wonder about the quality but I’m hoping the prices are less crazy. Relieved that this didn’t turn out to be another story of a restaurant theft! That first sentence had me worried. 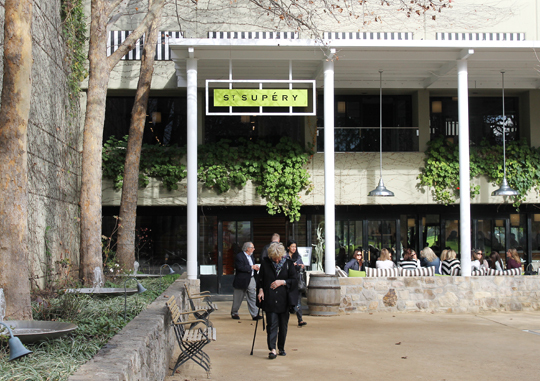 I do hope they start to grow in Napa, too.